ROCK AND ROLL CAMP !!!! Campers, your concerts this year were amazing! This past year has been the best year yet! Updated forms will be uploaded soon. Rock and Roll Camp 2019 is here!!! Download your registration forms, and we'll see you this summer! THIS PAST YEAR HAD AMAZING CONCERTS WITH VERY HIGH LEVELS OF PLAY. OUR CAMPERS ARE SERIOUS MUSICIANS! YOU EXCEEDED ALL OF OUR PREVIOUS YEARS OF MUSICAL PERFORMANCE. THIS YEAR PROMISES TO BE EVEN BETTER!
" Just wanted to let you know that my son has practiced every single day since he came home from camp, and is already talking about next year's program! Thanks for such a great opportunity for these kids to play and really enjoy music!" "I wanted to take this time to thank you for the wonderful experience my son had at your camp this past week. He learned so much, and thoroughly enjoyed the atmosphere. He was somewhat nervous about how he would "fit in", and he was immediately made to feel comfortable and welcome by both the staff and the other campers. The concert was a great showcase for all these talented musicians, and they looked like they were having so much fun! I'm amazed at how much was accomplished in so little time. My son has already told us he wants to do both sessions next year, so we will definitely be returning! "I'm sitting here clearing out my inbox and wanted to let you know that my son is having the best week at Rock & Roll camp. Every day he comes home with a giant grin on his face and is loving every minute of it. Thanks for all the hard work you and your team are doing." " This email is to thank you for providing such a wonderful camp last week for my son, (percussion). He came home so enthusiastic and happy each day! If I arrived early for pick up, I would sit in on the afternoon teaching sessions - I was so impressed with the level of teachers that you had and the unique perspective they each brought to the camp. My son woke up on Saturday and said, "I can't believe I don't have Rock and Roll Camp today. It is the best camp I have ever done!" 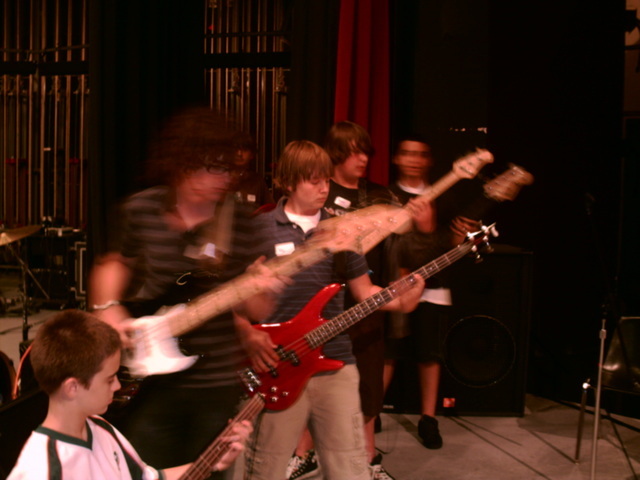 On that note.........I will thank you again and look forward to Rock and Roll Camp 2008!" CHECK OUT KERRY HAYES, "SOMEBODY ELSE", her NEW ALBUM on I-tunes. Miss KERRY Is our Voice instructor. Go see Absynthe Trio, Junkie Rush, and DTA (Death to ALL) Bobby Koelble's projects, in the Orlando Area and Globally . Have a band with recordings? Send me your website, soudcloud or facebook and I will put a link up in links, so others can listen to your music.